Full beer list for the event, scroll down! 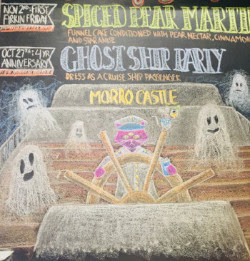 We are turning four and we would like you to help us re-create a night aboard the luxury liner, the SS Morro Castle. Be your own captain & dress as your favorite cruise person. 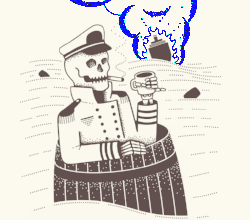 We will have three cruise destination inspired firkins that we will tap in order starting at 1pm, 3pm and then the last firkin at 5pm. Inspired by the Pisco Punch, created in San Francisco, home to the Beach Boys, we took our Funnel Cake and conditioned it with pineapple and lime juice & a splash of white grape juice. Join us every first Friday of the month for a brand new cask conditioned treat. November 2nd we will tap "Spiced Pear Martini" - our Funnel Cake conditioned with pear nectar, star anise & cinnamon. Our firkins are tapped at 4pm and generally don't last long.